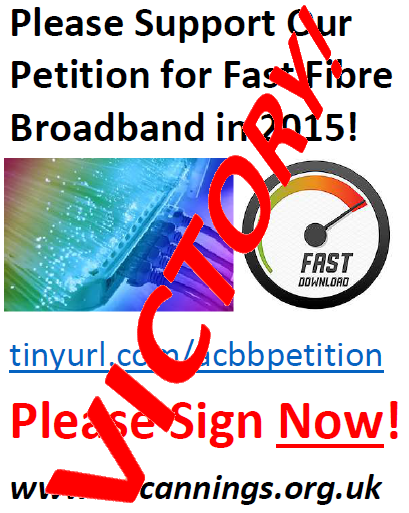 The Petition For Fibre Broadband - Victory! Thanks for signing our petition! 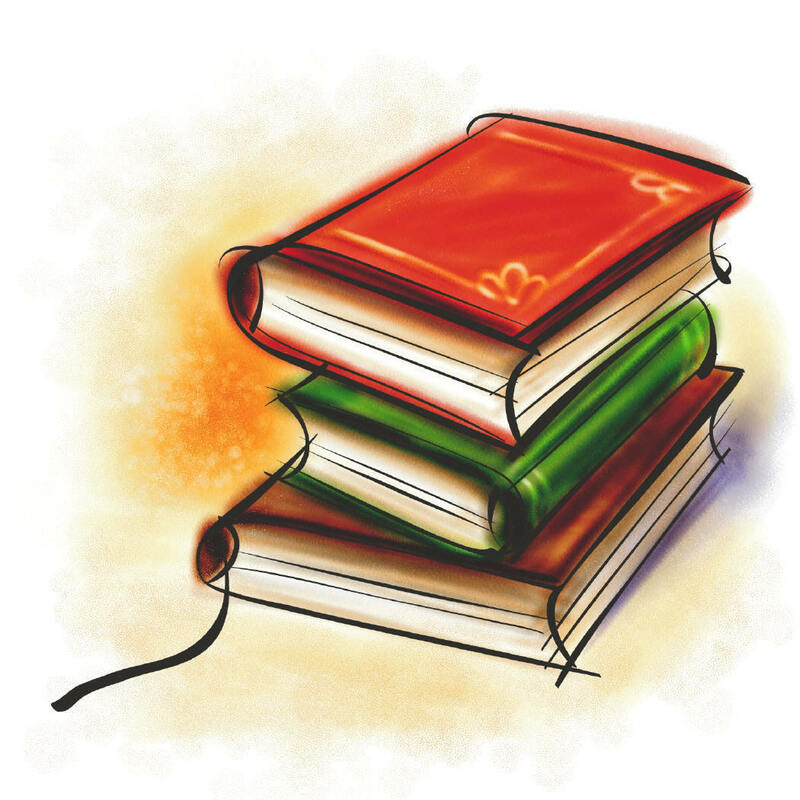 Click on the image above or here . To See what fibre broadband packages you can now get click here. I am writing to inform you that fibre broadband has been brought to All Cannings as part of Wiltshire Council's Wiltshire Online programme. Please help us to share this good news with your parish as we want as many residents as possible to benefit from Wiltshire Council's investment. 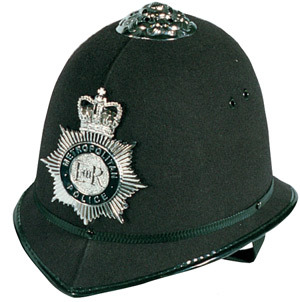 This is a very positive message for your community and we feel there is no better way to spread the word than through the well established communication channels of the parish council. Residents will need to check that they are able to benefit from this investment. There is a postcode checker on the Wiltshire Online website - www.wiltshireonline.org<http://www.wiltshireonline.org>. Although residents will not automatically receive the improved service, upgrading to fibre broadband is very simple, just a matter of contacting an Internet Service Provider. 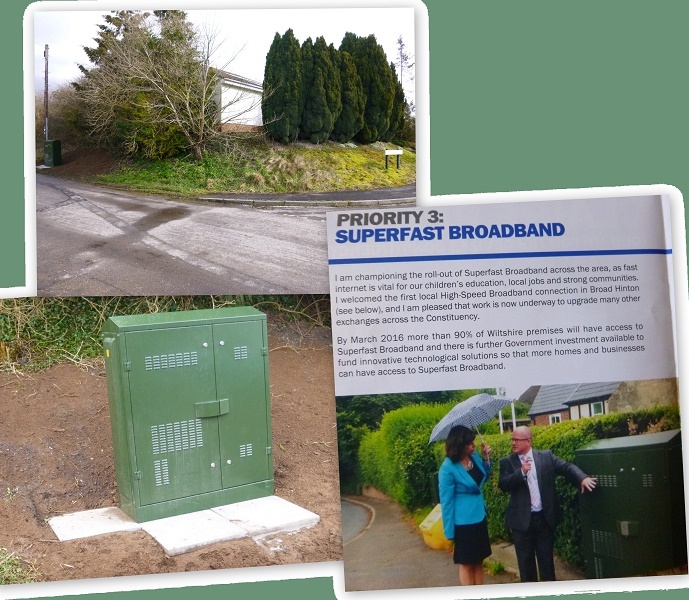 Following the survey of our exchange area by BT Openreach a new cabinet has been installed in Townsend, All Cannings, and perhaps elsewhere. We welcome this step forward. We do not have a definite date as yet, but we are working on it. It seems highly unlikely that the cabinet would be installed too far ahead of the roll-out. All Cannings Parish Council wishes to express its concerns that the Cannings Exchange, Wiltshire is falling behind in the rollout schedule of Fibre Optic super-fast broadband and asks that the Cannings Exchange is upgraded as soon as possible in early 2015. We are disappointed that it appears that at the moment BT and BT Openreach do not consider the Cannings Exchange covering the substantial villages and hamlets of All Cannings, Bishop’s Cannings, Allington, Horton, Coate and Etchilhampton in Wiltshire to be commercially viable for an upgrade to super-fast fibre broadband. The large number of residents and businesses in our area has not, it appears, ensured our place high up the roll-out schedule under the Wiltshire Online programme, whose key objectives include “To improve connectivity and provision of broadband access for the businesses and citizens of Wiltshire” to “enable all premises to receive the standard broadband of 2Mb (Government target 2015), with a minimum of 91% receiving superfast broadband”. Currently we receive broadband over the existing copper wire network which does not reach the target minimum speed of 2Mb in most, if not all, of the exchange area throughout most, if not all, of the day. The Wiltshire Online programme currently lists our area as “COMING SOON - We expect surveying activities in your area to begin in early 2015. Click the SURVEYING NOW box above to find out more information.” But that has already slipped from original estimates by approximately one year, and may slip again. Also the website states that “So my cabinet is being surveyed, does this mean that it will definitely be upgraded? Unfortunately we cannot guarantee this is the case”. 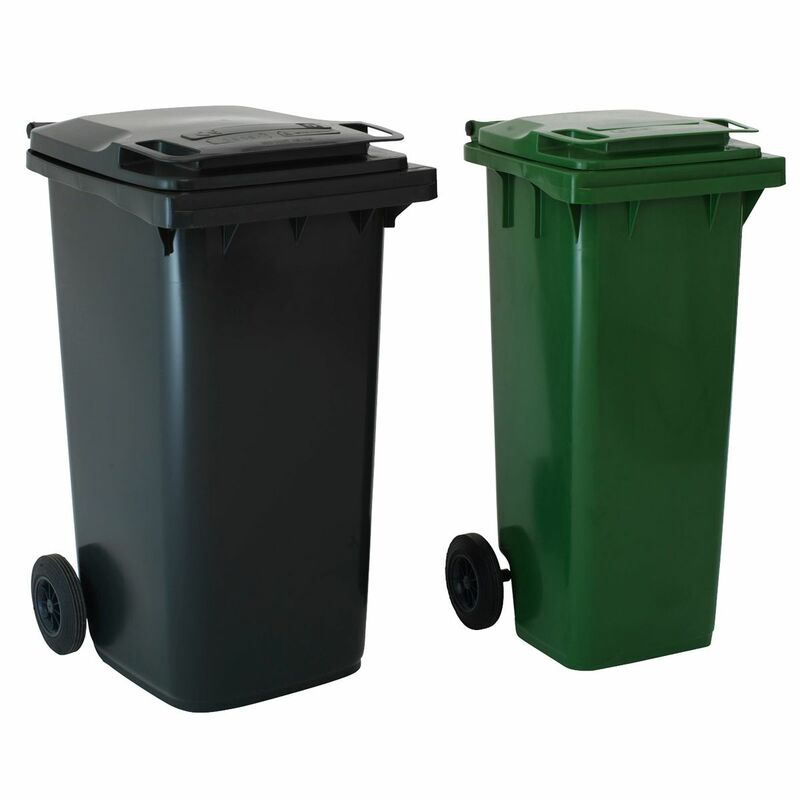 This issue is of great concern to many residents within our Parish and the neighbouring Parishes using the Cannings Exchange. It is especially of concern to those residents who rely upon the broadband service for their businesses or their work positions which now increasingly require home-working over virtual private networks (VPNs) from their homes. To prove the level of interest within the Cannings Exchange area All Cannings Parish Council instigated, at residents’ request, an on-line Petition which is steadily growing and already represents a significant number of residents and businesses within our immediate area. The petition can be found at http://tinyurl.com/acbbpetition . Please confirm that you are taking our concerns on board and are able to assure us that the Cannings Exchange will be upgraded to super-fast Fibre optic broadband early in 2015.